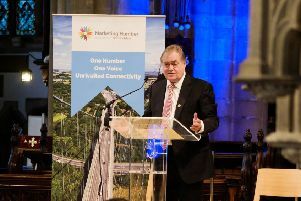 Jake Berry MP, Minister for the Northern Powerhouse, pictured speaking at an event in Halifax. Picture by James Hardisty. Plans for the North of England to set its own tax rates are being considered by the Government, according to reports. A proposed new department for the North would drive forward the region's transport, education and devolution agendas using funds generated by northern taxpayers, the Northern Powerhouse minister Jake Berry said, according to The Sunday Times. Mr Berry, quoted in the newspaper today, said: "With so much economic growth, it is time for the government to consider a department for the north of England, with its own secretary of state. "Liverpool once had its own Whitehall office, so it is not unprecedented to have a department based outside London." Scotland's devolved powers see it offer a lower 'starter' income tax rate. On giving powers to the North to set its own tax rates, Mr Berry said: "We should not close our minds to the localisation of taxation. READ MORE: North led the first industrial revolution, why can't it lead the fourth? "A big complaint is that money is being invested more in London and the south than in the north. Taxes raised in the north could be spent in the north. And we should not close our minds to varying income tax at a local level." Mr Berry added: "Many people across the north of England voted to leave the EU. There was a feeling of disempowerment and a lack of control of their lives. Northerners who voted for Brexit don't want those powers to be taken from the EU and stop at Whitehall. "Each region across the north should have its own bespoke devolution deal. An economic boom here would help drive this country's economy forward post-Brexit. We need the powers to be able to do that."